Very pleased with the new design and glad they have taken their time to get things right as the second set of plans and renderings would have spoiled the whole scheme in my opinion. The clean lines and curves makes such a difference to the look of the building and the use of materials will be a very important. Exciting to hear Ian mention about the height increase, this part of the center will feel like a truly urban city when tourists step outside of the train station. I still see in the promotional videos a large tower by the proposed government hub, do they still anticipate this to be built I wonder? Bus station work is definitely starting early next year,no more delays. No date specified. still, so glad this looks like they are definitely starting this early nxt yr with a 2020 opening. So when will we get to see more info/renders of what they are actually proceeding with? 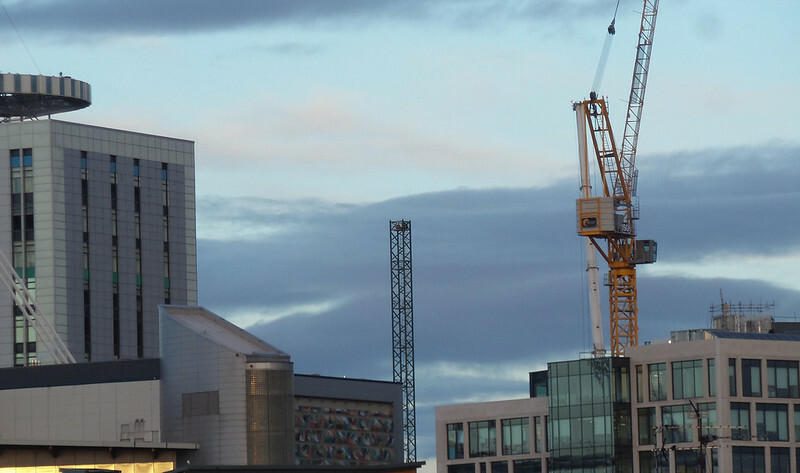 Looks like we will have our first green tower crane this weekend (or a fair bit of it!). Just walked past the site and the sections of crane next to BT Stadium House are being hoisted in to place! DaveE wrote: Looks like we will have our first green tower crane this weekend (or a fair bit of it!). Just walked past the site and the sections of crane next to BT Stadium House are being hoisted in to place! That's good news, I was wondering when they would start erecting these 3 substantial cranes. Let's hope the wind behaves itself. Second crane now being constructed at HMRC site. The team are constructing the crane to remove (I think) the crane at 2 Central Square either tonight or first thing tomorrow, it’s a tight squeeze in between 1 and 2 CSQ and they’ve been building the mobile crane all day! I know they look a bit darker doesn't help the photo is when they are wet, I think they will age well with time. The bright white slabs can be a bit bright when sun hits them and hard to keep clean?